CSUN was lucky enough to host two benefit concerts in support of its radio station, KCSN, this fall at the prestigious Valley Performing Arts Center. Slated for December 5th and 12th, the concerts will feature two full nights of music, as well as a meet-and-greet with the artists and radio station personalities. 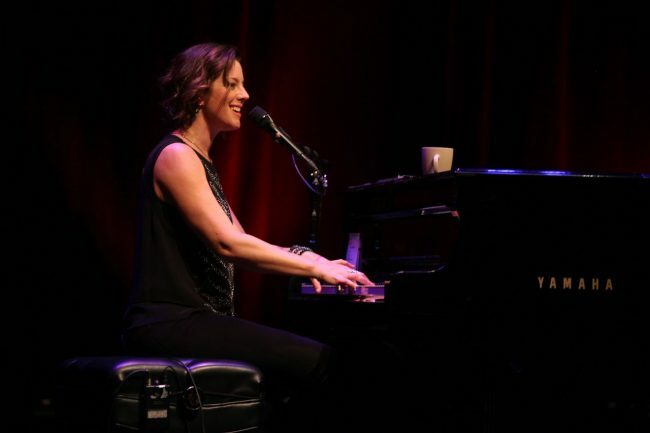 December 5th saw the first event of the series, an evening with intimate performances by indie darling Laura Marling and the incomparably popular Canadian songstress Sarah McLachlan. The VPAC, elegant and regal as always, served the perfect venue for some avid KCSN donors, as well as those who could hardly wait for McLachlan to tickle the ivories. The infamous KCSN DJ Sky Daniels took the stage to kick off the night and greet the concertgoers that had so graciously paid a great deal in support of the radio station and the forthcoming acts. Daniels gave Marling a brief introduction, as it was a considerably older crowd and one would hazard to guess their familiarity with Marling may be limited.? 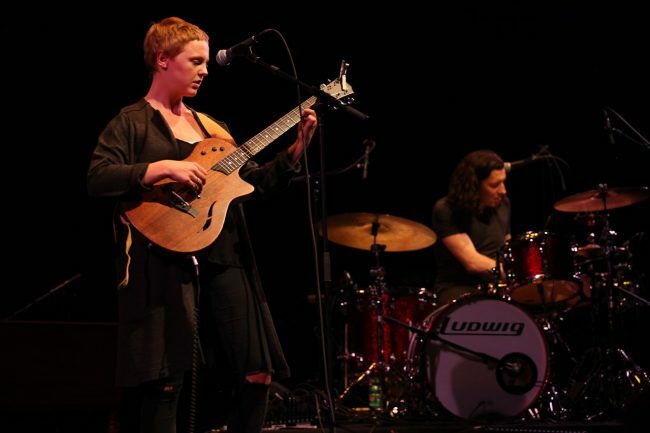 “If you aren’t a fan of Laura Marling already, I guarantee you will be after tonight,” boasted Daniels as Marling waited in the wings. Boy, was Sky right. Marling’s reputation certainly precedes her; the British songstress of Noah & The Whale fame has carved out a name for herself in the folk and British indie scene for quite some time now. One of the most critically acclaimed British folk artists of the past years, Marling’s accolades are certainly justified.? Armed with an acoustic guitar and looking pleasantly like a Celtic nymph, Marling’s songs seemed to emanate from some ancient druid collective – they were entrancingly familiar as much as they were altogether something unheard of. Listening to Marling warble over her uniquely phrased guitar prowess was an amazing experience, her songs ranging from her debut in 2008 to last year’s Once I Was An Eagle. Marling’s band joined her halfway through the set, a stupendous addition to an already mystical performance. Marling, though otherwise quiet and practically void of stage banter, had the crowd up on their feet for the last few numbers. Having clearly won over the house, it was the perfect segue into the main act. During the intermission, ticket holders and donors alike were in a hobnobbing frenzy in the VPAC lobby. Wine in hand, one older gentleman would shuffle over to a complete stranger and introduce himself, promptly asking how many times he had seen McLachlan perform before tonight. When the answer was a lowly 4, the older gentleman nodded politely and rebuked with a cool 7, finishing his Dixie Cup of chardonnay and reigning victorious at the VPAC. Slowly, the agitated crowd filtered back into the performance hall for the main event, excitement so viable in the air one could have reached for it and put it in his coat pocket.? 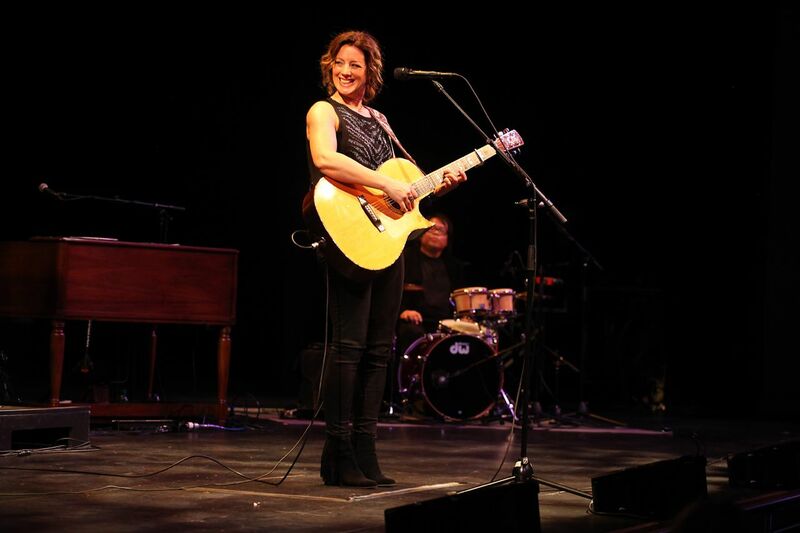 Sarah McLachlan strode out on stage to an overwhelmingly enormous response by her fans. McLachlan looks stunning in 2014, and the attendees made no bones about letting her know they agreed. Opening with such hits as “In Your Shoes”, “I Will Remember You” and “Building a Mystery,” the elation in the room only increased with every passing number. VPAC goers, though not generally rowdy, were shouting out requests left and right, cheering and whistling all the while as McLachlan played the hits. In McLachlan’s set was a masterful cover of Joni Mitchell’s “River,” the classic melancholy yuletide was given supreme justice by McLachlan, who captured perfectly the aesthetic of Mitchell’s woe. McLachlan, either accompanied by her highly adept band or with only her cello player showed a highly skilled musical prowess perhaps unbeknownst to some of those present at the benefit. 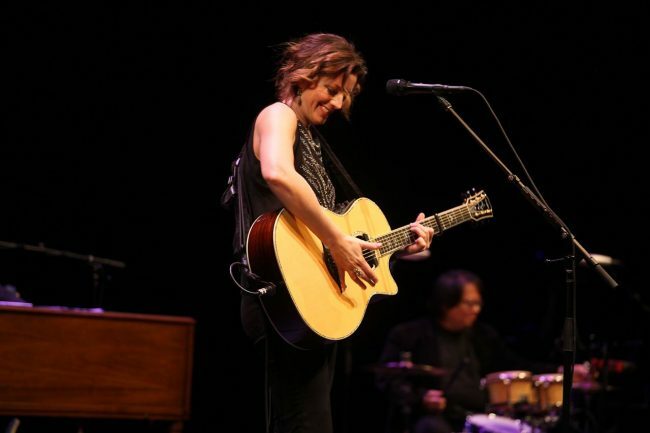 Aside from her obvious aptitude at piano, McLachlan’s guitar and ukulele skills should be noted. One also would be remised to forget McLachlan’s effortless mezzo soprano vocal range that has been preserved infinitely well over the years – it altogether culminated in a musician who has taken remarkable care of herself over the years. Unsurprisingly, McLachlan’s “Angel” had most of the crowd in tears, with images of ASPCA commercials in their minds and a haunting melody before them. In all, the McLachlan fans seemed not one bit disappointed with the concert before, and rightfully so.? It’s safe to say that the first weekend of KCSN’s Benefit Series went off without a hitch – weekend two should no doubt see the same return.